The US race activist Rachel Dolezal, who identifies as black despite being born white, is to visit South Africa to talk about her experience. Ms Dolezal will be the special guest at an event intended to promote a dialogue for a "non-racial" South Africa. In 2015 she was accused of deception after her parents said she was white. But her prospective South African hosts say her critics are jealous of her successful "racial transitioning". Ms Dolezal resigned as head of a local branch of a US anti-racism organisation after her parents spoke publicly about their daughter. She says the rejection she has faced subsequently has meant she has been unable to find a job and has also recently changed her name, saying she should now be known as Nkechi Amare Diallo. In South Africa she will be attending the inaugural event of the group Quest for Non Racial South African Society Dialogue (QfNRSASD), which promotes an agenda for racial harmony among South Africans. 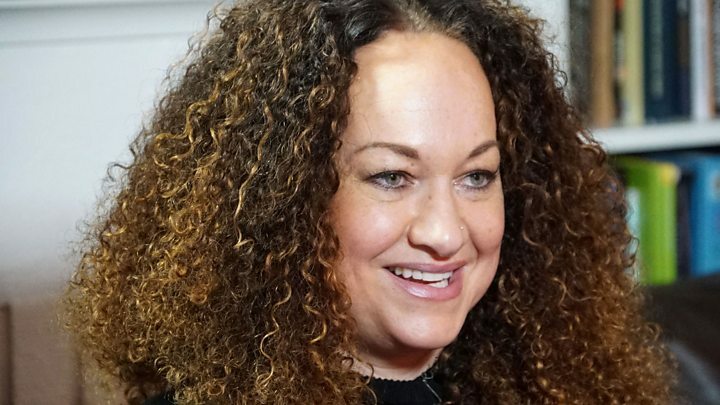 "They collectively critique and butcher Rachel Dolezal only because she successfully transitioned race, a stuck reality for them, and inconceivable only because it is believed it is not possible, if not an unpardonable sin," the group's founder Bishop Clyde Ramalaine said. Ms Dolezal was "evidence of the myth of race", he added. Last month Ms Dolezal told the BBC that the idea of race was "a lie" and argued that the concept of "transracial" - similar to that of transgender - was useful in describing people such as herself. "Race is a lie. How can I be accused of lying about a lie," she said. She has written a book about her experience, In Full Color: Finding My Place in a Black and White World, in which she recounts her "quest to find herself in a black and white world". South Africa is still recovering from the legacy of apartheid - minority white rule which made black South Africans into second-class citizens until democracy was introduced in 1994 and Nelson Mandela became president.